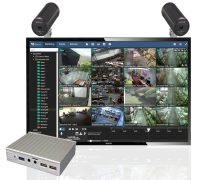 Widely used by police forces, building contractors and event organisers, EyeLynx's PharosTM all-in-one surveillance system is the only true High Definition (HD) Rapid Deployment surveillance system on the market with Edge Recording Cluster ERCTM capability. Within surveillance systems, the image processing and recording computer is the invisible but essential core engine whose performance is key to the effectiveness of the system. For rapid deployment systems used for crowd control, the performance requirements are no less – but the size and the power used are also critical. These cameras need to operate reliably from a portable power source like a battery for days at a time capturing images and storing them for subsequent review and analysis. Widely used by police forces, building contractors and event organisers, EyeLynx's PharosTM all-in-one surveillance system is the only true High Definition (HD) Rapid Deployment surveillance system on the market with Edge Recording Cluster ERCTM capability. With SharpView NVR software running on an ultra-compact and low power TinyGreenPC FitPC2i, PharosTM records multiple slave HD cameras 24/7 and whenever the perimeter is compromised or a potential intruder approaches too close to the fence, SharpView will send a snapshot alert to the control centre or assigned person's mobile devices for visual verification. PharosTM has been used at some extremely high profile events, including the previous two Conservative Party conferences in Manchester and Birmingham for example. Commenting on his choice of TinyGreenPC for the PC platform, EyeLynx Managing Director Jay Patel said, “SharpView is an efficient software solution that records HD video from multiple cameras and processes the images in real time. The challenge was to find a very low power PC, small enough to be hidden in the camera case and able to run for several days from a battery system. EyeLynx also offers an industrial grade stand alone 12V battery power system of 100 to 300Ah with solar/wind charging options to give Pharos a real go-anywhere at any time capability. TinyGreenPC FitPC2i draws just 8W allowing the whole system to run from these batteries for several days without recharging. The TeraByte Hard Disk fitted as standard can store over 30 days of evidential quality HD video, based on a 1.6GHz Intel Atom CPU, the PC offers more than enough power to run the efficient SharpView NVR software. Yet all this is packaged in a case just 10cm x 11.5cm by 2cm deep – less than a quarter of the area of an A4 sheet of paper.